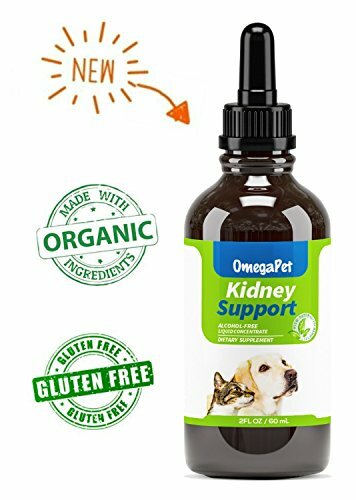 ✅ WHILE OTHER KIDNEY SUPPORT PRODUCTS may have unintended side effects, make symptoms worse, or simply yield no change in mood or eating, OmegaPet's KSF1 contains clinically proven natural ingredients that work together to support optimal kidney and bladder health. This means healthier appetite, more energy, more play time and no meds! ✅ CLEAVERS LEAF - It is a naturally diuretic so it is also good for the kidneys and urinary tract. Cleavers can be used to treat cystitis and urinary conditions. CORNSILK - Corn silk is used for bladder infections, inflammation of the urinary system, inflammation of the prostate, kidney stones, and bedwetting. If you have any questions about this product by OmegaPet, contact us by completing and submitting the form below. If you are looking for a specif part number, please include it with your message.